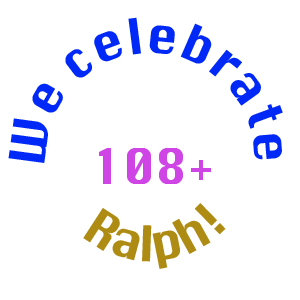 Ralph shuffled off this mortal coil January 14, 2016, less than two months shy of his 109th birthday. He was a genius, an inventive genius. With his insight, for converting analog to digital, he ushered in a whole new world for mankind. He was also a great father and husband. Joining the technical staff of Bell Labs in its early days, Ralph Miller worked on the teams that would blossom into the Labs’ golden age. Among the tens of patents to Ralph Miller's name is the invention of Pulse Code Modulation. The story of PCM tells how the Labs’ dedication to war work in the 1940s laid the foundation for today’s digital transmission. Ralph Miller was perhaps the sole surviving voice, to testify to those years. Fortunately for those of us with shorter memories, he recounted how he and his colleagues took first steps to the Internet today. For that story put concisely … read on below. For a very brief curriculum vitae, go here. Four pages of anecdotes – tales of creating System X – are here. The National Security Agency (where Ralph Miller did some of his wartime work) put two brief histories of System X, here and here, on its web site. (SigSaly was a name, as also noted below, used for a version of System X.) In the second NSA link, near the bottom in Appendix B, you see a chart reproduced from, and credited to, Ralph Miller's portion of the Bell System history above. Now there is also a more recent history from the NSA – one that traces technical development of the vocoder, right from its System X (aka SigSaly) days, up to nearer the present, where it finally uses digital signal processing. In that more current history, here, we see how innovation continued to be stimulated by the same problem of voice quality – the nudge that led Ralph Miller to come up, in the first place, with pulse code modulation. For detail on the PCM story, see the Bell Labs history as above, also the wikipedia entry as below. Contact information is all the way below. In 1929 Ralph Miller went from Kansas State University, he a newly minted electrical engineer, to Bell Telephone Laboratories to become finally one among a pantheon in the Labs' golden age. In the following ten years he obtained patents, among others, for the Quartz Oscillating Frequency Divider and aspects of the Vocoder. This was a prelude of patents to come. In 1939 amid gathering storms of war O.E. Buckley, soon to head the Labs, attended a meeting of the National Defense Research Council (NDRC). Deep concern emerged because Roosevelt and Churchill, diplomats, and the US military were regularly using a communication system that was not secure. Buckley returned to the Labs committed to address that problem. Top-level Labs discussion, because of the limited bandwidth available, quickly focused on the Vocoder as a starting point for a new secure approach. The ensuing research and development of the X system (aka SigSaly and the Green Hornet) created an unbreakably secure connection between the White House and Churchill’s bunker, also for MacArthur’s signal operations ship and for Eisenhower in North Africa. Subsequent development in the next couple decades, mainly by the Labs, produced the parallel AMTRC and KY3 systems. The insights generated in this war effort proved half a century later to be precursor to today’s high speed digital transmission. But from the mid-1940s through the mid-1970s word of the patents was held in secrecy by the US government. These 30 patents, including Pulse Code Modulation among a number of others held by RL Miller, had secured military and diplomatic transmission through the war. But these decades of secrecy shrouded from view the underpinnings for today’s network. Notwithstanding today, that earlier work from the golden age of the Labs was the foundation. From that ultimately would grow ARPANET and the Internet. Now we can see.